This option also follows the classic route in its entirety, but to accommodate trekkers on a time budget we skip the rest days, making it a little more strenuous, but we’ll see all the mountains, cross the same passes, and even visit the San Antonio overlook from which we can admire Siula Grande, the mountain made famous by Joe Simpson in “Touching the Void”. 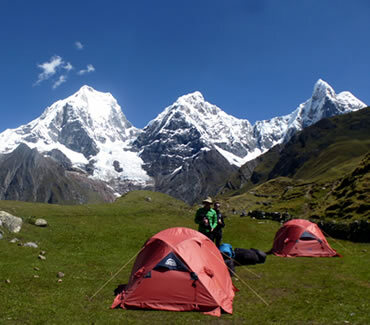 If you have time constraints but still want to fully experience the Cordillera Huayhuash, you should consider this option. Day 2: Cuartelwain – Qaqanan pass 4750m - Mitucocha 4230m. Day 3: Mitucocha - Carhuac pass 4600m - Carhuacocha 4138m. Day 4: Carhuacocha - Carnicero pass 4630m - Huayhuash 4330m. Day 6: Viconga - Cuyoc pass 5000m - Guanacpatay 4300m. Day 7: Guanacpatay – San Antonio Pass 5010m – Huayllapa 3600m. Day 8: Huayllapa - Tapush pass 4800m - Qashpapampa 4600m. Day 9: Qashpapampa - Yaucha pass 4750m - Jahuacocha 4070m. • Depending on time, it is possible to have a rest day at beautiful Lake Carhuacocha. • You’ll need at least two days of acclimatization before heading out on the trek. We suggest taking a bus tour of Llanganuco lakes or the Chavin de Huantar ruins in Huaraz, and/or doing one of the various day hikes in the Cordillera Blanca around Huaraz. • Bring a water bottle with you, in the summer season it gets very hot.